During the mid 1800's thousands of Latter-day Saint converts from England, Wales and many other European countries settled much of Western USA. Their stories are one of faith, devotion, commitment and at times sorrow and loss. 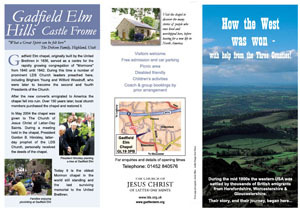 Some of the history including key locations and places to visit have been documented in two pamphlets with maps and brief histories from South Wales and The Three Counties and can be downloaded below. Many of the early Latter-day Saint converts pioneering journeys were made possible and greatly influenced by one amazing Welshman - Captain Dan Jones, a Welsh Mariner who built and captained a Mississippi Steam Boat, he was also a powerful orator and was responsible for the translation into Welsh of much of the early Latter-day Saints church materials and the migration of many of the early Welsh saints who joined with other members of The Church of Jesus Christ of Latter-day Saints in Nauvoo to then make the pioneer trek west and together settle over 600 towns and cities. In 1840, Apostles of The Church of Jesus Christ of Latter-day Saints travelled from Nauvoo, Illinois in America to The Three Counties and taught the local people the Gospel of Jesus Christ. 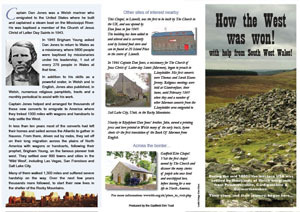 During the next 9 months, 0ver 1,800 people were 'converted' including almost the entire membership of a local Christian organisation know as the United Brethren. Within two years, most had left the British Isles to gather in Nauvoo and from there, through persecution and hardship they travelled on the now famous Trek West to become the early pioneers and settlers of Las Vegas, San Francisco and Salt Lake City.